Great workers embody what appear to be paradoxes. They are visionary yet detailed, serious yet playful, passionate yet dispassionate. 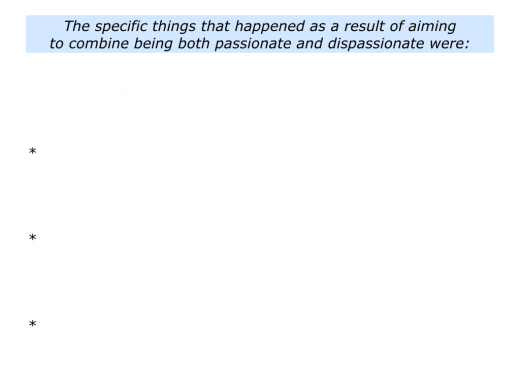 Such workers feel passionately about their vocation. They believe in encouraging people, making medical breakthroughs, designing beautiful things or whatever. Sometimes they choose to be dispassionate, however, when making decisions. They are calm and gather data about what is happening. When faced by a difficult challenge, for example, they may ask some of the following questions. What is actually happening? What is the actual data that shows these things are happening? What are the successful and unsuccessful patterns? Looking ahead, what are the possible things that could happen? What will be the consequences of these happening? Let’s step back and see the big picture. What are our short, medium and long-term goals? What are the real results we want to achieve? What is the picture of success? What are the possible options for going forward? What are the consequences – the pluses and minuses – of each option? What is the attractiveness of each option? Are there any other potential creative solutions? Which route – or combination of routes – do we want to follow? How can we follow this route successfully? How can we build on the pluses and minimise the minuses? What else can we do to give ourselves the greatest chance of achieving success? Looking ahead, how can we prevent similar difficulties happening in the future? How can we ensure things are set up to succeed? How can we keep improving and achieve sustainable success? Such workers combine both the heart and head when making decisions. They focus on both feelings and facts. Looking back, can you think of a situation when you combined these qualities? You may have cared passionately about something, but was also dispassionate enough to make good decisions. 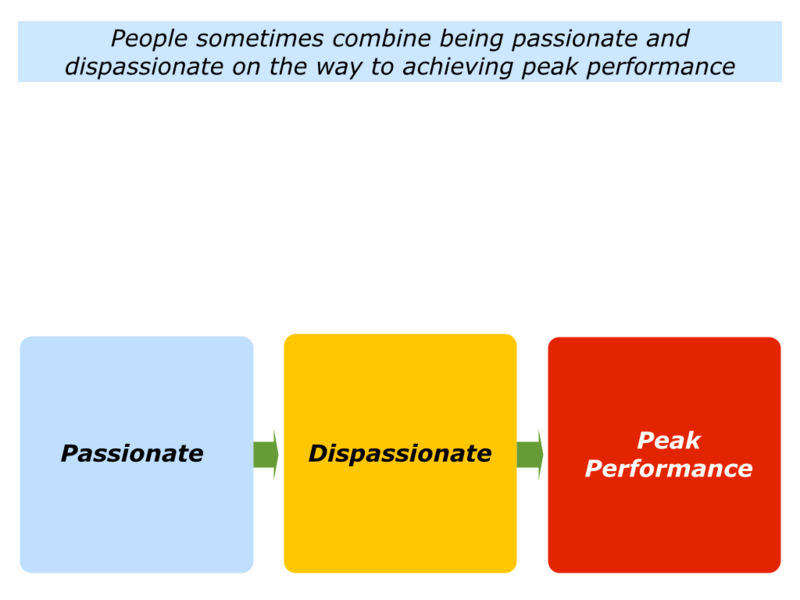 Describe a specific situation in the past when you aimed to combine being passionate and dispassionate to achieve peak performance. Describe the specific things you did then to combine these qualities. Describe the specific things that happened as a result of taking those steps. People who follow their vocation often care deeply about their work. They are often able to stay calm, however, when making key decisions. Different people apply this approach in different situations. Below is an excerpt from a BBC article about what it takes to be a bomb disposal specialist. You can find the complete article via the following link. Maj Chris Hunter has defused more than 60 improvised explosive devices (IEDs) and thousands of conventional munitions in his 10 years as a counter-terrorist bomb disposal specialist. “When you walk up to a bomb to neutralise it by hand, the adrenaline is flowing and you go into tunnel vision mode to try to dispel any fear you’ve got. Adrenaline helps,” he says. The 36-year-old, who served in Iraq, Afghanistan and Northern Ireland between 1997 and 2007, compares his job to an “extreme game of chess”. He describes how the “sophisticated” bomb makers can lure you in with one device only to target you with a second. 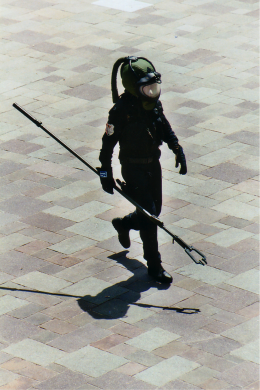 There are broadly two types of bomb disposal specialist: Royal Engineers, who deal with conventional weapons, and those in the Royal Logistic Corps (RLC), who tackle the improvised devices. Ask what they have in common, and you’ll hear intelligence, a love of measured risk, and the ability to problem solve and be analytical and logical. Maj Hunter, who has two children, says one difficulty is reintegrating back into society. When you have seen the mass carnage a bomb causes, he says, neutralising a device is one of the most gratifying things you can do. Different people have different kinds of work. Not everybody is a bomb disposal expert. You will have your own approach to balancing being passionate and dispassionate in your work. Looking at my own life, for example, I adopted this approach when running a therapeutic community. We cared deeply about helping troubled young people. But it was vital to make considered decisions when judging whether to take in certain individuals. Some had a history of drug abuse, suicide attempts or violence. Should we offer them the opportunity to join us or should they stay locked up in an institution? The applicants needed to sign up to certain ground rules, of course, but nothing was guaranteed. Whilst caring for the person, we had to make calculated decisions. Would accepting the young person – rather than having them stay locked up – be of benefit to them, the other people in the community and the wider society? Making this decision called for combining both the heart and head. Let’s return to your own life and work. Looking ahead, can you think of a situation when you may need to combine being passionate and dispassionate? This could be in your personal or professional life. Looking at the situation, how can you continue to care deeply, yet also try to be calm? How can you follow the creative problem solving process of focusing on clarity, creativity and concrete results? How can you clarify the real results to achieve? How can you consider the potential choices and the consequences of each option? 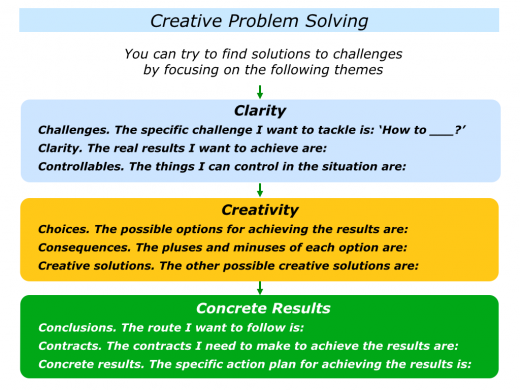 How can you find other creative solutions? How can you settle on your chosen option and translate this into a clear action plan? How can you do your best to achieve the picture of success? 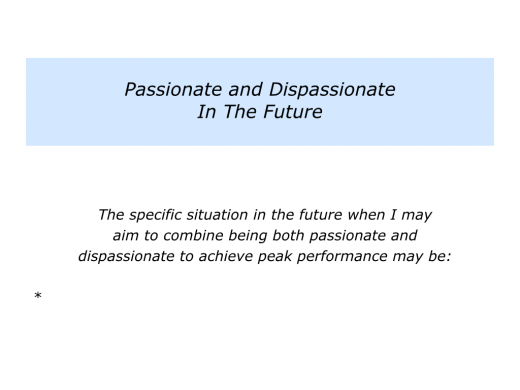 Describe a specific situation in the future when you may aim to combine being both passionate and dispassionate to achieve peak performance. Describe the specific things you can do to combine these qualities. 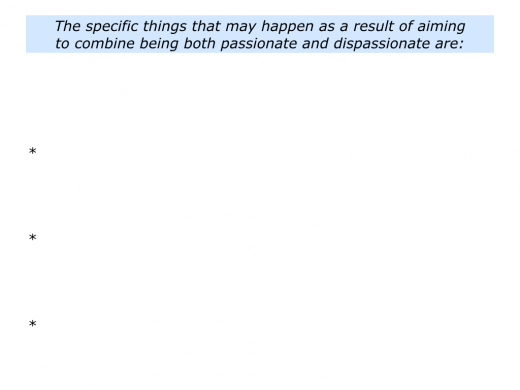 Describe the specific things that may happen as a result of combining these successfully.